(9:30 a.m. EST) -- Richard Branson's new cruise line, Virgin Voyages, is putting down roots in PortMiami. 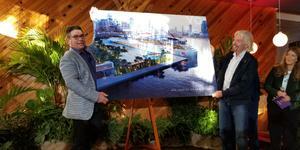 In a small news conference today at The Standard in Miami Beach, the Virgin Group founder -- alongside the cruise line's CEO Tom McAlpin and local officials -- revealed plans to build a new terminal that will be designed specifically for Virgin Voyages ships, the first of which, the adults-only Scarlet Lady, is due in early 2020. The new 100,000 square-foot terminal, named Palm Grove, will be located on the north side of the port overlooking Biscayne Bay, with the Miami skyline in the background. It will feature an eclectic design, developed by Miami-based firm Arquitectonica, that draws inspiration from the history of Miami Beach and is intended to put passengers in vacation mode as soon as they step through the door. "Miami is an incredible city and one of my favorite places to work and play," Branson said. "From our headquarters for Hotels, Voyages and now Trains USA, South Florida has quickly become another home for Virgin brands in the leisure travel sector." At the news conference, Branson also revealed his company will build a Virgin Hotel in Miami, furthering Virgin's commitment to South Florida. Pending approval, the terminal is expected to be complete by November 2021, in time for the winter cruise season. Until then, Scarlet Lady, the line's first cruise ship, will be based in PortMiami's Terminal F.
"Investing in new cruise terminals positions Miami-Dade County as a global destination for visitors," Rebeca Sosa, Miami-Dade County's economic development and tourism committee chairman, said. "A continued partnership between Miami-Dade County and Virgin Voyages can only be beneficial to the expansion of tourism in our region. More cruise lines, terminals and vessels represents thousands of jobs and increased opportunities for our community." Virgin Voyages aims to achieve a LEED Gold Certification from the U.S. Green Building Council with its new terminal. The goal is part of Virgin Voyages' overall commitment to sustainability; its ships will be equipped with scrubbing technology designed to reduce sulfur emissions, and no single-use plastics will be used onboard. In addition to revealing the new terminal plans, Virgin Voyages said Scarlet Lady will continue to sail the Caribbean through 2021. Previously the line had only disclosed its inaugural season, which includes cruises to Cuba. It also confirmed its second ship will sail seasonally out of Miami, though McAlpin declined to elaborate on when or how long the season will be. Scarlet Lady will have capacity for 2,750 passengers and boast a "Vitamin Sea" concept that focuses on passenger wellness, relaxation and fun. Public spaces will include a tattoo studio, outdoor fitness center and extensive spa facilities. It is the first of four new ships planned for the line, with the others slated to launch in 2021, 2022 and 2023. Bookings for Scarlet Lady open February 14, 2019. Virgin Voyages' plans follow a trend of cruise lines developing new homeport terminals, particularly in PortMiami. Royal Caribbean celebrated the grand opening of Terminal A in early November; Norwegian Cruise Line and MSC Cruises also look to open new terminals in fall 2019 and fall 2022, respectively.